From taking a morning shower to washing the dishes from dinner, we rely on heated water throughout our day, every day. Why not make your source for hot water an efficient one by upgrading to an energy-efficient model? You can even receive a rebate while you’re at it. Using advanced technology, these efficient water heaters harness the warmth already present in a household’s ambient air and produces hot water – while consuming around half the electricity used by conventional models. The cost of electricity fluctuates depending on how much of it is being used at any given time. ETS Water Heaters take advantage of this by drawing electricity during times of low demand (such as overnight), when it’s less expensive. They use this bargain electricity to heat the water stored inside their Envirofoam®-insulated tank, which allows only 5ºF of heat loss in 24 hours. With this innovation, you’ll have hot water whenever you need it, for less. ETS Water Heaters are easy on electricity, but that doesn’t mean they’re not tough. Built here in the U.S. with water-tight polyethylene materials, they resist damage and rust in any environment. On average, a water heater needs to be replaced every 10 years. But the ultra-durability of these ETS Water Heaters is backed by a lifetime warranty, leaving you with fewer worries, and more peace of mind. Lightweight yet heavy-duty, ETS Water Heaters can be installed without the need for special equipment. This reduces the time, cost and headache of getting your water heater up and running. For professional installation services, contact your cooperative. Mixing Valve: An anti-scald device blends hot water with cold water to ensure consistent faucet temperature and reduced hot water consumption. Better Insulation: 5 inches of foam insulation minimizes standby heat loss, keeping water hot and ready to use. Impressive Capacity: Tanks are available with a capacity of up to 105 gallons, allowing for even large families to enjoy water heated by off-peak energy all day. 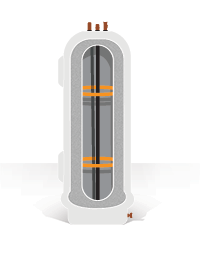 High-Tech Heat: Heating elements are in direct contact with water, minimizing heat loss for near 100% efficiency. HPWHs are the first electric water heaters to earn the ENERGY STAR® rating. They achieve their outstanding efficiency by using electricity to move heat, not generate it. Think of the process as operating like a reverse refrigerator. By harnessing the warmth already present in a household’s ambient air and using it to heat water, these units can add a savings of up to $300 a year. While HPWHs are capable of producing enough hot water for the entire family, built-in electric resistance elements automatically contribute to heating in case the surrounding air becomes too cold, or if you need extra hot water. It’s extra insurance that you’ll have all the hot water you need, whenever you need it. As an added benefit, HPWHs give off cool exhaust air, which can assist in home cooling and dehumidification. Or, this air could be directed outdoors through ductwork. And they operate without combustible elements, offering increased safety compared to gas water heaters. For even more peace of mind, you can rest assured in your investment, thanks to a lifetime warranty. Qualified professionals can get your pump hooked up quickly, and your home won’t be turned upside down during the process. For information on dealers and installers, contact your cooperative. Evaporator: Liquid refrigerant is vaporized by the evaporator. Compressor: A fan moves heat from the surrounding air, which is absorbed by the refrigerant before traveling to the compressor, which increases its pressure and temperature. This also serves as a dehumidifier. 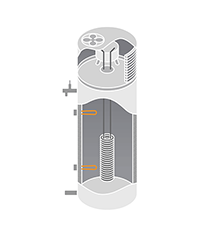 Condenser Coil: The vaporized refrigerant runs through the condenser coil inside the storage tank, transferring its collected heat to the water inside. Insulation: Heat loss is minimized by professional-grade insulation. Heating Elements: Heating elements use electricity to contribute to water heating only when necessary, to ensure you always have enough hot water.